I’m just back from a week in St Kitts, a small, but perfectly formed island, in the Caribbean. It’s one of the oldest colonised territories, and tiny, at just 23 miles long by 5 miles wide sitting where the Caribbean meets the Atlantic Ocean. Think beaches of soft white sand lined with palm trees and lapped by warm turquoise seas. 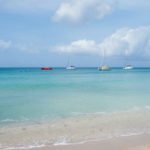 The island’s friendly people are always ready with a smile or a wave and there’s a constant beat of Reggae as the island’s backtrack which goes perfectly with a rum punch. But there’s more to St Kitts than this laid-back Caribbean vibe. So. Much. More. My brief was to check out the food, culture and heritage on the island. 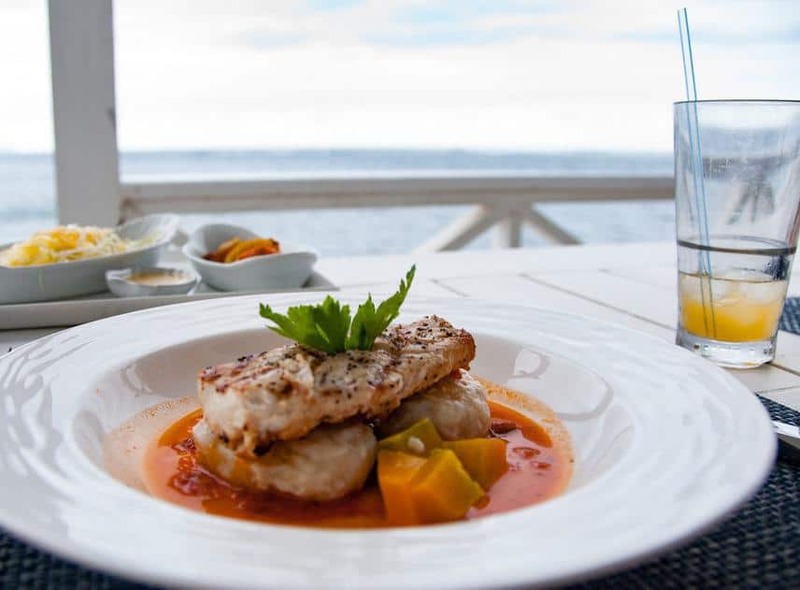 I’m happiest when embarking on a foodie adventure and I sipped, sniffed and savoured my way around the island getting stuck into fresh fish dishes like Stewed Saltfish and Wahoo fish bagels. Johnny Cakes and delicious coconut dumplings were a revelation and then there were island staples of sweet potato, plantain and mango. We also sampled ‘goat water’ which was much tastier than it actually sounds and not what you’d think it might be. 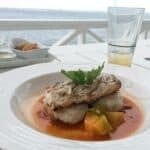 Here’s Mahi-Mahi Fish with pumpkin and a view at Arthur’s, a beach-side restaurant, which is part of Belle Mont Farm, serving up organic and sustainable food. Read more about St Kitt’s food and restaurants here. We tried out a varied selection of restaurants from beachside shacks to restored plantation estates and everything in between. Local favourites like The Gallery Cafe in Basseterre and organic home-grown dishes from farmers Judah and Yayah Fari at Ital Creations were big hits. Obviously, it would have been rude not to test out all the different varieties of rum found on the island – intense research was essential. All in the name of duty of course. Ting is a refreshing fizzy grapefruit drink – add rum and you get Ting with a Sting! There’s a rich heritage and history in St Kitts and, as with most places, it’s had its shady moments. Brimstone Hill Fortress is a UNESCO World Heritage Site which the British took 100 years to build using African slave labour – most of St Kitt’s population today are their descendants. The island has been fought over by the British and the French whose rivalry lasted over 100 years wiping out the indigenous population of Caribs. Nowadays, of course, everyone gets on pretty well. Sugar was the Island’s main industry until the 1980s and there are remnants of plantations and estates dotted around the island. Old sugar mills, chimneys and the island’s stunning landscapes can be enjoyed by taking a journey on St Kitt’s Scenic Railway. 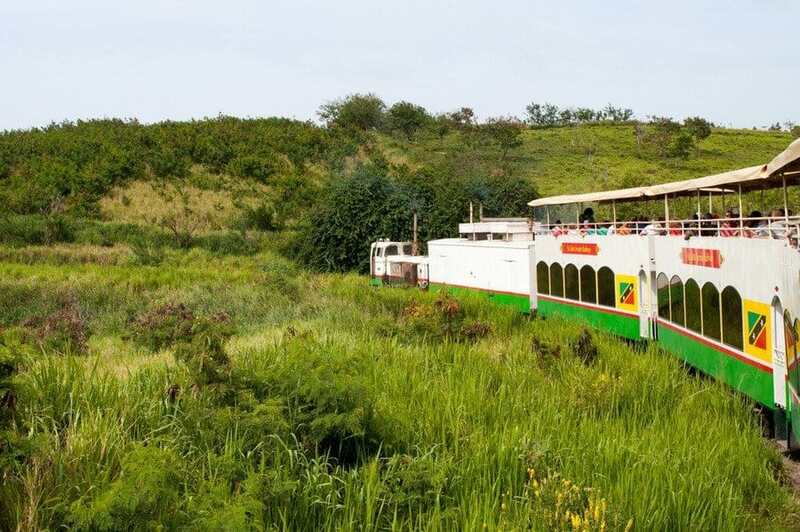 The narrow-gauge railway was built between 1912 and 1926 to carry sugar cane around the island – nowadays it transports tourists, many from the cruise ships that dock in Basseterre each day. St Kitts is dominated by Mount Liamuiga a 3,792 ft volcano, which means the island is hugely fertile – you’ll find the evidence on your plate. The rainforest has actually only grown up in the last 25 years and continues to spread. We spent a fascinating couple of hours trekking through it with ‘King of the Jungle’ O’Neil from O’Neil’s Rainforest Tours. We discovered some surprising creatures – did you know there are Soldier Crabs in St Kitt’s rainforest? A dream came true for me in St Kitts when I saw a turtle in the wild for the first time along with shoals of pretty neon fish during a snorkelling trip with Blue Water Safaris. 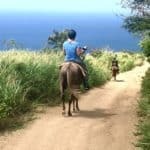 A horseback ride with Scott from Trinity Inn Stables took us on a peaceful journey through the Kittitian countryside. We checked out one of the beaches for signs of turtle nesting with Gary Buckles from the Sea Turtle Monitoring Network and found the tracks of a massive 1.5m wide Leatherback turtle who’d nested the previous night. The network is a non-profit making group which do their best to protect the turtles. They run night watch tours to the turtle beaches where volunteers can monitor and help the turtles nest. These beaches are otherwise closed to the public at night. There’s adrenaline adventure to be found in St Kitts which saw us zip-lining through the canopy to get a monkey’s eye view of the rainforest. Monkeys outnumber humans in St Kitts two to one and were introduced to the island over 300 years ago from Africa. We had fun on the water too. After snorkelling, Glenford and Sean from Blue Water Safaris took us on a full-throttle catamaran trip to Nevis, St Kitt’s sister island. They say you haven’t been to Nevis if you haven’t visited Sunshine’s so we stopped by for their signature cocktail a Killer Bee which definitely had a sting in the tail. We took out glass-bottomed kayaks in the crystal clear waters of Cockleshell Bay with St Kitt’s Water Sports who also offer jet-skis, fly-boarding, paddleboarding, paragliding and kite-surfing. 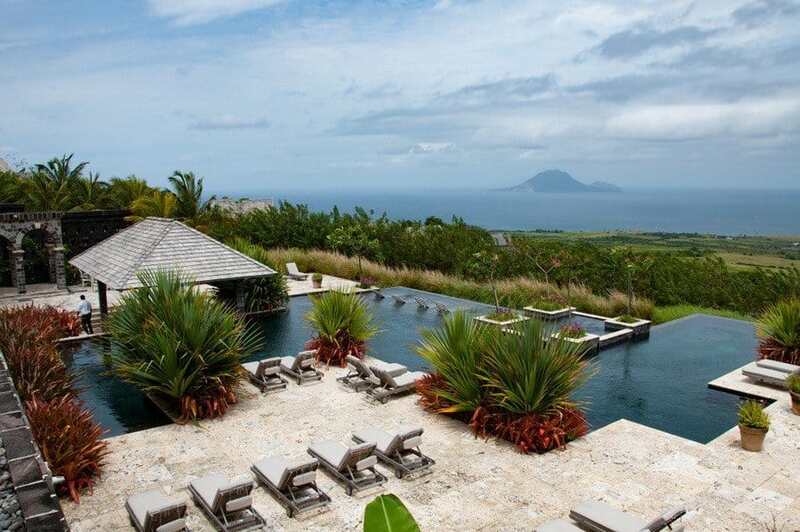 Belle Mont Farm is a sustainable, organic resort set in the foothills of Kittitian Hill. This super-luxe resort is made up of villas and cottages each with an epic view. This is the kind of place you’d want for your honeymoon – if you open the double doors in the bedroom you’ve got fabulous views out to the horizon from the huge double bed! There’s every kind of luxury from private infinity pools, pull-down projector TVs and outdoor rainforest bathrooms. The public spaces are beautifully decorated with a mix of modern colonial and retro quirky and the food is organic farm to table produce. Belle Mont also boasts the world’s most edible golf course – as if it doesn’t take me long enough to get around 18 holes already! 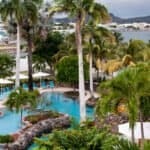 Check out the St Kitts luxury list. We stayed at two hotels during our visit. 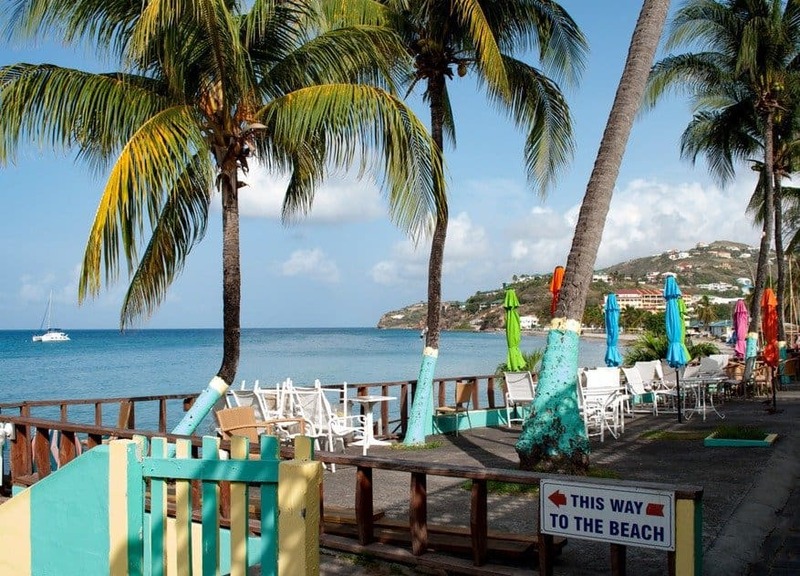 Two nights at Ocean Terrace Inn a smart hotel just a short stroll from Basseterre, the island’s capital, and near to the historical sites. 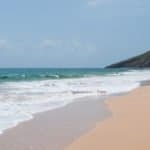 The final four nights were spent at Timothy Beach which, as the name suggests, is right on the beach on the Caribbean side of the island. I loved the laid back feel here perfect for swimming, beach time and relaxing. There’s so much more to tell you about St Kitts and I can’t wait. 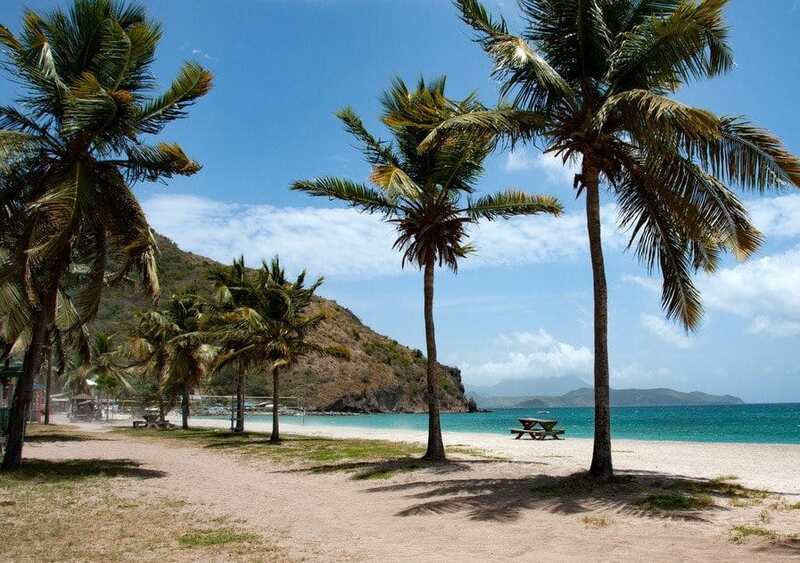 In the meantime, if you want to check out the island for yourself BA are currently offering UK residents 7 nights in St Kitts including flights from £579. See here for more details. Look lovely! I hope to get back to the Caribbean soon. Wow what a beautiful place, great photos! We haven’t been there but it’s on our bucket list now! What a beautiful place, I haven’t been there myself but I’ve heard great things! It’s Caribbean laid back beaches, food and fun without the crowds. Doesn’t get much better! Ummm….what an utterly fabulous brief to have been given!!! It kind of sounds like a dream role to me! I really enjoyed the flavours of the Caribbean when I did a cruise there last year but don’t think I tried any coconut dumplings because they sound great and I’m sure I’d have remembered them but St Kitt’s wasn’t one of the islands that we stopped at and now I definitely want to return to that part of the world to see it. St Kitts is so relaxing but there’s so much to do and see as well – every kind of bliss! Looks stunning there! I’d love to visit someday. It’s a beautiful little island ? I’m a fan of UNESCO World Heritage sites so I’d definitely like to visit Brimstone Hill Fortress, and in fact the whole island looks idyllic. Looking forward to reading more of your updates! The views from the Fortress were incredible and the site itself fascinating. I always love to visit a UNESCO World Heritage site too. It was all of those and more! Such a fabulous trip! I’m sure the memory of it will stay with us forever. Looks lovely – I really need to get back to the Caribbean soon and St Kitts looks like a beauty! I literally fell in love with St Lucia last year, St Kitts looks equally gorgeous!! What a gorgeous place! Beautiful post, thanks for sharing.